In a major scientific first, a team of developmental biologists has built a functional mouse heart from human tissues. The results herald a future where specific patches of heart muscle – or even the whole organ – could be grown for transplantation. Top image of mouse heart by Wellcome Images via flickr. The work, which was led by University of Pittsburgh's Lei Yang and is recounted in the latest issue of Nature Communications, hinges on the combination of two major regenerative medicine techniques. The first is the use of human induced pluripotent stem cells (iPS cells). iPS cells are mature, differentiated cells (liver cells, for instance, or skin cells) that have been reprogrammed into an undifferentiated state. Like embryonic stem cells, iPS cells can be stimulated by growth factors to give rise to a wide range of different cell types; just because an iPS cell started out as, say, a renal cell expelled in the urine, doesn't mean it can't be coaxed into becoming dental tissue (fun fact: a team of researchers recently did exactly that) – it just needs the right set of instructions. Yang and his colleagues took cells from a small biopsy of human skin, reverse-engineered them into iPS cells, then instructed them to produce what are called multipotential cardiovascular progenitor cells. These "MCP cells," as they're called, are the precursors to three very important types of heart cell: cardiomyocytes, endothelial cells, and smooth muscle cells. The second technique is a tissue-preparation process known as decellularization, which Yang and his colleagues used to strip a mouse heart of its cells. What remained of the organ was a framework rich in non-living, but structurally and developmentally important, tissue known as extracellular matrix (ECM). The researchers repopulated this ECM-laden heart-scaffold with their MCP cells. Within three weeks, the mouse heart had been reconstituted with cardiomyocytes, endothelial cells and smooth muscle cells. The heart was pulsing on its own (to the rhythm of roughly 45 beats per minute), generating mechanical force and even responding to drugs. "Nobody has tried using these MCPs for heart regeneration before," explained Yang in a statement. A similar procedure, which saw decellularized rat hearts repopulated with the heart cells of newborn rats, was successfully performed back in 2007; what makes this big news is the implementation of human iPS cells and the effects of ECM on MCP cells. "It turns out that the heart's extracellular matrix can send signals to guide the MCPs into becoming the specialized cells that are needed for proper heart function," explains Yang. The study also demonstrates that the ECM's intricate weave of fibrous proteins and carbohydrates not only promotes differentiation but proliferation of human heart tissue. The million-dollar question, of course, is whether the technique can be used to create biomechanically viable tissue on the scale needed to perform patch-jobs on, say, the weak portion of a diseased heart, or even – dare we say it? – a whole, fully transplantable heart. "One of our next goals is to see if it's feasible to make a patch of human heart muscle," said Yang. 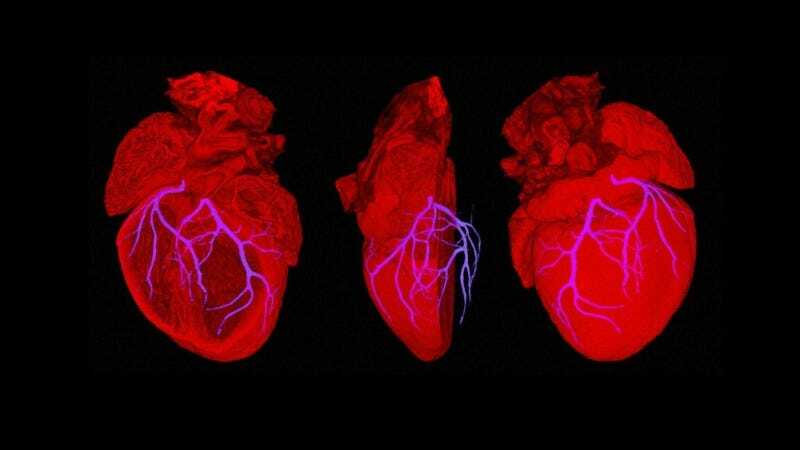 "We could use patches to replace a region damaged by a heart attack. That might be easier to achieve because it won't require as many cells as a whole human-sized organ would." In the meantime, however, Yang and his colleagues expect their strategy will be more immediately useful in the study of early heart formation, or the preclinical testing of new therapeutic agents. The researchers' findings are published in the latest issue of Nature Communications.